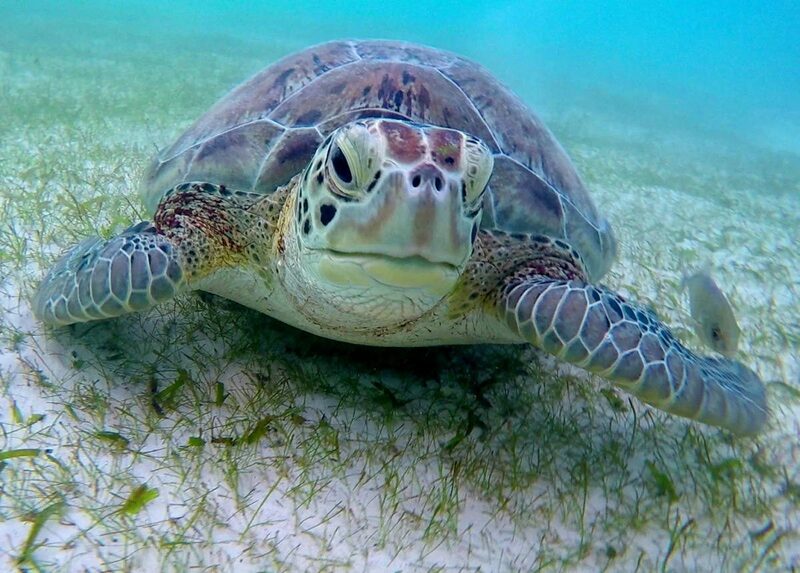 Did you know that you could swim with green sea turtles in their natural habitat in Mexico? Amazing, isn’t it? Do you know what’s even more incredible? 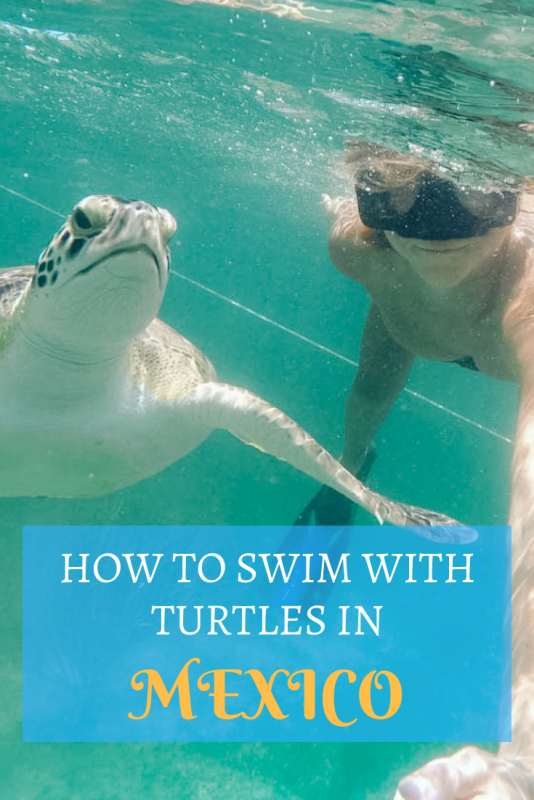 This activity is totally free and this is why I’ve done it three times already while living in Playa del Carmen as the turtles are only 20 minutes away! Some readers informed me that they found a bunch of armed marines and giant sign that swimming with turtles has been suspended indefinitely to prevent deterioration, and further damage to the marine ecosystems, which include various species of marine turtles. They could only swim with hands behind their backs in a small area without any turtles around. But, it’s not the case every day. One day you’ll be able to swim with them, another day you won’t be able to, as the situation is unstable. Either way, I still recommend you to at least try. How to Get to Akumal? Getting to Akumal from Playa del Carmen is easy. You can hop on a colectivo (minibus) from the colectivo stand located on Calle 2 Norte between Avenida 15 and 20 (search for Correos Mexico on Google Maps). Tell the driver you’re going to ‘Akumal Puente’ and he’ll drop you off on the other side of the road that you can cross using the bridge. Colectivo will cost only 35 pesos (approx. $1.60) each way. If you’re coming with children or want to have more privacy you can obviously get a taxi to Akumal, but colectivos are equally safe so don’t be afraid of them! I recommend you bringing your own snorkel equipment to avoid paying huge rental prices. If you don’t have your own you can easily purchase a set at some stores in Playa del Carmen. Don’t pre-book a turtle tour, as they’re a big tourist trap and charge $50 for taking you to the water as you can just walk in and swim on your own. You can follow the people to get to the beach or simply continue straight and see some signs for the beach. 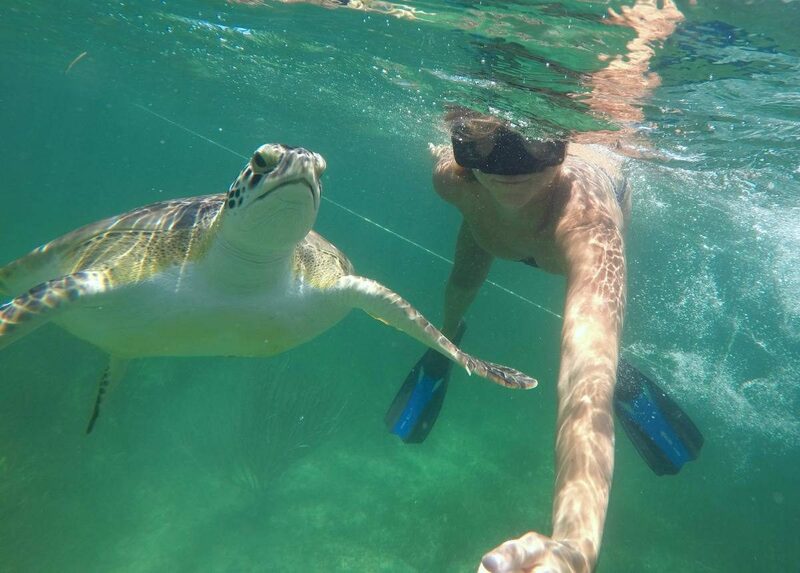 You will be approached by various tour guides asking if you want to do a tour to swim with turtles. My advice: don’t do it and continue walking, as you don’t need a guide to see turtles. Both times when I visited Akumal I saw my first turtles within 5 minutes of entering the water, so even I could be a tour guide in this case. This has NOT changed in 2017. Last year everyone was able to bring their own snorkel equipment and simply jump into the water without a guide or extra gear. Unfortunately, due to the rising amount of ignorant people who were touching and grabbing turtles, this is no longer allowed. Usage of life jacket is now obligatory and fins are forbidden too. You can rent a lifejacket from any dive store for 95 Pesos (approx. $4.5). If you need a snorkeling equipment you’ll need to pay an extra 85 Pesos (approx. $4). It’s still cheaper than a tour. There’s one important rule when visiting Akumal: DON’T touch the turtles! As cute as they may look to you hugging them may harm them, so please don’t do this. 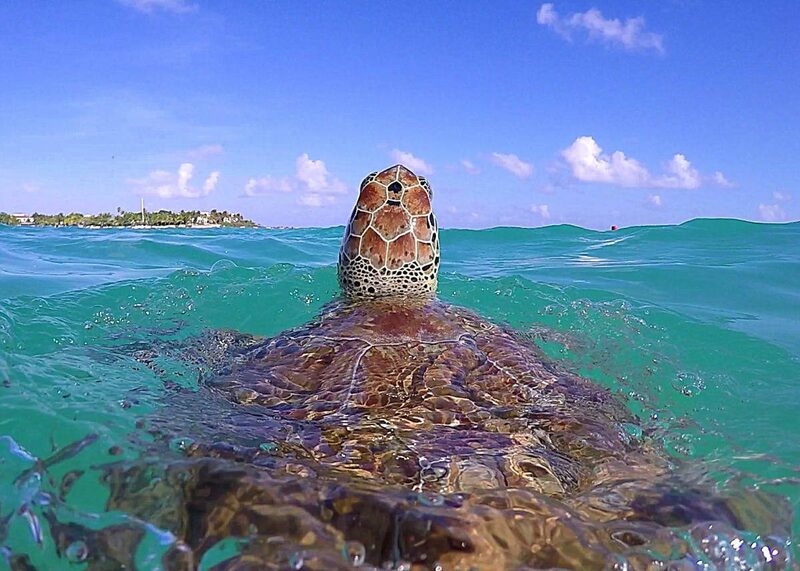 Swim with turtles, leaving a decent distance as they need their personal space, the same way as humans do. Swim nearby but never touch the turtle. 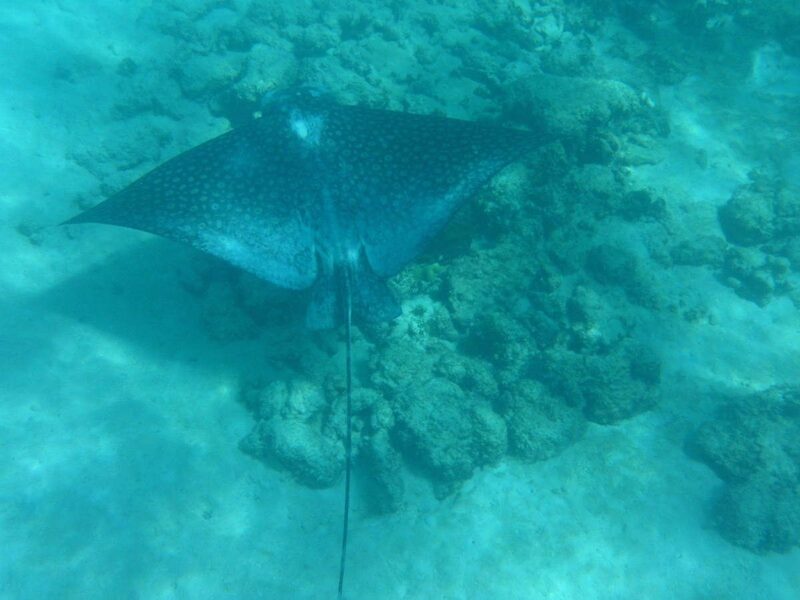 Even more important… be careful with stingrays (yes, these guys that killed Steve Irwin)! When I visited Akumal for the first time I was convinced they were manta rays and I swam quite close to them which was a big mistake. This ain’t a manta ray! If you have any other questions regarding visiting Akumal please comment below and I’ll try to help you as much as I can! Previous Post Is Istanbul Safe to Visit Now as a Woman? We went to Akumal when we road tripped around the Yucatan Peninsula last year, and it was our favourite thing we did during the trip! Such an amazing experience. We brought our own snorkel gear but rented life jackets so that we could get access to a locker for our valuables. Great post Anna! Swimming with the turtles in Akumal was definitely one of the highlights of my time in Mexico. Just one of the many things I love about Akumal! I really enjoyed our swim with the turtles as well. Good tip about bringing your own gear. The rentals can add up if you go more than once. Wow, thanks for this secret! How about from Cancun or Cozumel? We have time shares there. Would it be easy to go to Akumai Puente too? Would love to take my grandkids there! From Cozumel it’s easy – just get a ferry to Playa del Carmen and then colectivo 🙂 Ithink there’s a direct colectivo from Cancun as well actually, but not 100% sure ! Wow, those turtles are huge! I’d love to visit and great recommendation to bring your own equipment. Not only is it cheaper, but it’s also more sanitary! Love this! I am definitely going to have to check it out! Can you still swim with the turtles there? We were told by a tour company that this was now closed to swimming? I wouldn’t use any tour operators to do this honestly. I know that there was a fight between some people who wanted to close access to the beach, but when I did it a few months ago you definitely could. Just like I said in the post: ignore all the vendors who’ll try to charge you for something that’s completely free to do. Is it possible to swim with turtles currently, February 23, 2017? We are in Quinta Roo and were told Akumal is closed and protected by the army. They’ve been saying this more or less every three months for at least two years. I don’t think it’s true. I had so much fun doing this last July. However I forgot my iphone and had to use a disposable film camera and I also got the worst motion sickness that I’ve ever had in my entire life. I seriously couldn’t walk for at least a half hour after i got out of the water. Have you ever heard of anyone getting sick like this after snorkeling? I’m thinking it has something to do with my Multiple Sclerosis. I saw lots of great turtles though so I’d probably do it again even with the motion sickness. Hmm… never to be honest. I herd of divers getting sick, but not snorkelers. Hmm… never to be honest. I heard of divers getting sick, but not snorkelers. I got sea sick while snorkeling once too! The water was rough, my mask didn’t fit right, so I was constantly looking up out of the water and down again, until I suddenly felt terrible!!! I wanted to die. I got sick while snorkeling once. Turns out, there were tiny jellyfish in the water and I had an allergic reaction. You couldn’t see the jellyfish well enough to tell what they wre. I have a Destination Wedding that I’m bringing everyone to see the turtles. So we can bring our own masks and snorkels, and we have to rent a life jacket now? No more swimming freely without one correct? Yes, you need to rent life jackets now unfortunately. We recently brought our own snorkel gear and it was fine, but when my friend went he said he was having hard time getting just a life jacket. However, if you’re bringing a group I’m sure they’ll be happy and let you do that. There is federal protection of natural resources. All activities of swimming with the turtles are suspended to prevent deterioration and further damage to the marine ecosystems which include various species of marine turtles. There were armed Marines (with huuuuuge guns) guarding the area and we were asked to snorkel with life jackets and swim with our hands behind our backs within a designated swim area. There weren’t any sea turtles in that area at all. The reef was still beautiful and we had a great time. That’s really sad to hear 🙁 But thanks for letting me know. I literally received an information today that it all depends of the day you go. Hello Anna, I’m enjoying reading your blog. I was reading about swimming with the turtles in Kuma & read an article in your local paper, which was attached by a commenter above. Am I confused in my reading, or are people now required to use tour companies to access swimming with the turtles? The article link is below. Any help is appreciated, we will be there in July 2017 & this opportunity sounds amazing, but I’d rather not get my family shot! ???? Things change every week to be honest, sometimes it even depends of the day you go. Last time I checked you need to use a guide from one of the dive centers there to go snorkeling I’d suggest you to get to the beach and see how things are. Have fun in Mexico, Melissa Bahre. Ooooh how did that work out for you and your family Melissa Bahre? We just left the bay and I was pretty upset at the site of TONS of people on the beach. I really hope something is done to protect these ENDANGER species. I see a lot of comments on the cheap way to do this and tho I see this angle I feel this isn’t the best idea to spread. This is an ENDANGERED Species. Once they are gone they are GONE. BTW the pictures in your post are illegal interactions in my book. All for a selfie? What an EGO driven mentality. My heart breaks seeing this… WE are our environment, if we do not take as stand and promote with GRACE and not a FREE FOR ALL, then we are doomed! Its bad enough that the coral ( SECOND LARGEST CORAL REFF IN THE WORLD) is disappearing! All of these MEGA parks and septic systems along with greed….Man, so crazy…. This whole area will be GONE at the rate thats happening now! I feel more needs to be done and Im personally buying a house in the area to help spread and protect. Just like in the US where we have the grand canyon its all regulated as to how many people can go a year. This must be done! I agree with you that many people do illegal things. However, none of the things or photos show any illegal actions. Turtles were left untouched. Also, this is Latin America – many things aren’t regulated. the “guides” aren’t always guiding the group, but they charge money. They’re not marine biologists, but mostly just locals blocking the beach to protest and make money. I’m not sure if you’ve been to the Galapagos for instance, but many “guides” there encourage tourists to ‘ride’ the turtles (hole their shells and ride on them underwater). People think since these are the GUIDES it’s something normal to do. We were in Akumal in January, 2018. Unfortunately, we got impression that taking a tour was compulsory, life jackets and locker were included. The only thing I can recommend is to avoid all offers from many ‘guides’ on your way to the beach and take the guide on the beach from the lockers location. Please confirm if nothing still changed. It varies day by day unfortunately. I think that paying one of the guides on the beach is actually the best way to do it cause then he or she can tell you stories and info about their beautiful country during the tour. All of the local guides I met in Akumal and the other towns I visited in Yucatan were so friendly and so full of interesting information that they were so happy to share with a visitor. Plus you’re putting money directly into locals’ pockets so they can afford to support their families doing what they love. At present there is only one entrance to Akumal Beach at the Centro Ecologico Akumal, if not going via a hotel. The entry fee for foreigners is 100 pesos, but a hired guide can get you in for 50. The guide, lifejacket, and snorkel equipment for one hour costs 350 pesos per person. However, if you rent only the equipment (75 for life jacket plus 75 for snorkel gear) you can keep it for the entire day. Listening to many of the recommendations on this blog, we decided not to pay a guide, especially because we did not want to feel restrained by time. This paid off because we saw turtles only after our second hour of snorkeling. We still learn a lot about the local flora, fauna, and culture simply by speaking to locals whenever we can. Thank you for your comment. Me and my friend are going to riviera maya in two weeks and akumal is def on the list.